IT & Marketing – Like Peanut Butter and Jelly? - Eric D. Brown, D.Sc. IT & Marketing – Like Peanut Butter and Jelly? I love peanut butter and jelly. What a great idea to put those to food items together on a piece of bread. 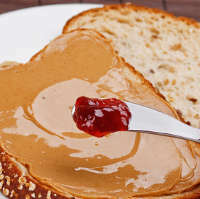 Have you ever thought about how much the information technology and marketing organizations are like a PB&J samich? Yes…I said samich….been wondering how to work it into a post forever. Never worry…I use sandwich from here on out…maybe. Think about IT as the peanut butter in a PB&J sandwich. Peanut Butter, much like IT, is the glue that keeps things together. While Peanut Butter can be found in a few different varieties…its pretty much the same everywhere. it may have a different taste if you try different types / brands of PB but you pretty much know what you’re getting when you ask for peanut butter, you get peanut butter. Kind of like IT…you know IT is pretty much the same regardless of where you go. Now…the marketing team is the jelly. It can come in many varieties. Grape. Strawberry. Kiwi. Cactus. Squash? Yep…Squash Jelly. Just like real jelly, there are different varieties…different companies need different approaches to marketing. The problem…when you ask for jelly, you really don’t know exactly what type of jelly you are going to get…unless you are very specific (squash jelly please). The same can be said for marketing….unless you are extremely specific, you may get something other than what you asked for. So….when you put the PB (IT) and Jelly (Marketing) together, you get something delicious right? Sometimes. But sometimes you end up with a Peanut Butter and Squash Jelly Sandwich. You got what you asked for, but maybe not what you expected. I’ve started describing a portion of my consulting practice as that of marketing technologist. Because I’ve spent a good portion of the last few years working with and for marketing organizations as their technology strategist, manager and liaison with the information technology organization. In this role, I’ve leveraged my technology background along with my marketing experience to form a bridge between IT and Marketing and, for the most part, I’ve been very successful in getting things done. I’ve found this role is one that most organizations haven’t figured out yet. Many companies have IT groups who feel as though they must own and manage all technology within the organization. Most marketing groups need technology to do their job but have a hard time interacting with IT. These types of situations lead to the rise of Shadow IT throughout organizations. Most companies fight Shadow IT with arguments about security, platform stability, technology platform integration and budgets…and normally these fights are won by the IT group and the CIO. Usually, the IT group within an organization owns, manages and leads all technology efforts and their happy to do it. This isn’t necessarily a bad thing. The IT group has the technology expertise and should be involved in any technology decisions and, in fact, should manage the operational aspects of any technology platforms within the organization. .
That said….there are many times when it makes sense for areas like marketing, HR and Finance to step into a leadership role to ensure they have the necessary technology to move forward. Note that I said leadership role. I’m not arguing that non-IT groups should go out and find their own vendor/technology, purchase it, implement and manage it. I prefer to see the IT function remain in the middle of all technology decisions but I do see a role for technologists within these non-IT functions. Think of the marketing technologist as the sandwich maker. As I’ve said, the marketing technologist is someone with a technology and marketing background. This person can easily interact with both IT and Marketing to ensure that everyone understands exactly what is needed, what the goals are and why the request is being made. This person can also help to lead the IT developers and architects down the right path when developing functionality / websites for the marketing team. This person is also in a perfect spot to lead branding and usability of new technology platforms. The Marketing Technologist is the one that figures out what type of bread you want, just how much peanut butter you need, what type of jelly is wanted and how to combine them to form the sandwich. The marketing technologist is also in a place to spread the peanut butter and jelly on the bread, makes sure everything fits nicely together, works well and looks nice. Jump over to the signup process that Scott Brinker mentions in his Shadow IT vs. Shadow Marketing article (awesome post BTW)….he had to go through five or six screens to download a white paper. I’m sure someone within the organization asked for a website for users to register and download whitepapers. While the website works, the registration process, usability and usefulness of the website are downright bad. Would it have been better with someone acting as a liaison between IT and Marketing? Who knows…maybe yes…maybe no. But…in most instances, these types of fiasco’s can be avoided. Here’s my Five Steps for helping IT and marketing work better together. Step 1 – move away from the ‘us’ and ‘them’ mentality. You can’t have marketing today without IT…and IT won’t have a reason to exist within most organizations without a good marketing function. Just like you can’t have a PB&J without both the PB and the J. Step 2 – Agree that IT owns and controls technology, but Marketing lead its own initiatives. While its true that peanut butter is usually more noticeable on a PB&J sandwich than the jelly, you can’t have one without the other. The Jelly adds just as much to the taste equation. Stop worrying about who controls technology and ‘who does what’ and focus on getting your projects done. Step 3 – Agree that Marketing owns branding and usability. Remember that Squash Jelly? You don’t want that do you? If you want to make sure your organization gets the right jelly, you’ve got to make sure the Marketing team is leading and owning the look/feel, usability and branding of all projects that have any ability to interact with clients, employees and partners. Step 4 – Engage with each other – IT and Marketing need to engage. Let the technology savvy folks in marketing lead some technology projects. Let some IT folks into the marketing projects. Get to know each other. You’re going to be on the same bread together…might as well know each other right? Step 5 – Promote marketing technology as an area for growth. Find those folks that have an interest in both IT and marketing and put them into the marketing technologist role. You’ve got to have someone who knows how to make the PB&J sandwich. While these five steps aren’t guaranteed to create a successful relationship between Marketing and IT, they’ll go a long way to making it easier to get marketing technology projects initiated and completed. Who knows…if you work hard enough, you might just make the perfect PB&J samich too. When I wrote “You got what you asked for, but maybe not what you expected.” I felt it deserved more…maybe I’ll write something up next week to revisit it. RT @clecompte: IT & Marketing – Like Peanut Butter and Jelly? http://j.mp/cxHjxp // Like the idea of a marketing technologist.